Plenty of things can get between a child and a good book – TV, video games and even kid-friendly cellphone apps. But despite all those potential distractions, there’s still a place in every child’s home for the printed word and such characters as Tom Sawyer, Winnie-the-Pooh and Curious George. “Even in the digital age, the physical book is not outdated, and only the ones with shallow content will become so,” says J.L. Baumann, author of Mackenzie Goes Adventuring (www.snookton.com), a picture book that stresses the importance of education. Introducing books to children at even the youngest age pays off. Research that was presented at the 2017 Pediatric Academic Societies Meeting showed that reading books with a child beginning in early infancy can boost vocabulary and reading skills four years later, before the start of elementary school. Baumann is a big proponent of reading aloud, adding a theatrical flair that brings his characters to life when he reads his own books to children. Make plenty of books available. A lack of access to a large selection of books at home can make a difference in how much children read, according to the biannual “Kids and Family Reading” report that Scholastic released earlier this year. Children who are frequent readers, devouring books for fun five to seven days a week, have on average a whopping 141 children’s books in their homes. Those who read for fun one day or less each week have an average of 65 books in their homes – still a lot, but not quite enough, according to the study. “It will cost about $20 to take two children to lunch with you at McDonald’s, a meal that will be forgotten in no time,” Baumann says. “You could use that same money for a book that could become a cherished possession.” And if money is an issue, a weekly visit to the library can help. J.L. 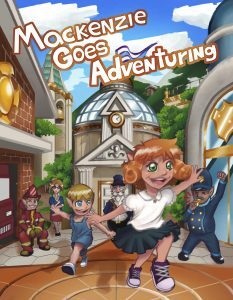 Baumann is the author of the children’s book Mackenzie Goes Adventuring (www.snookton.com) and numerous works for adults, including A Gothic Rendezvous and Sonnets of the Provocative Kind. He is the father of four children, all of whom were home schooled, and has a background in accounting. He is also the founder of Prosperity Financial Services Inc. and Postmortem Publications Inc.